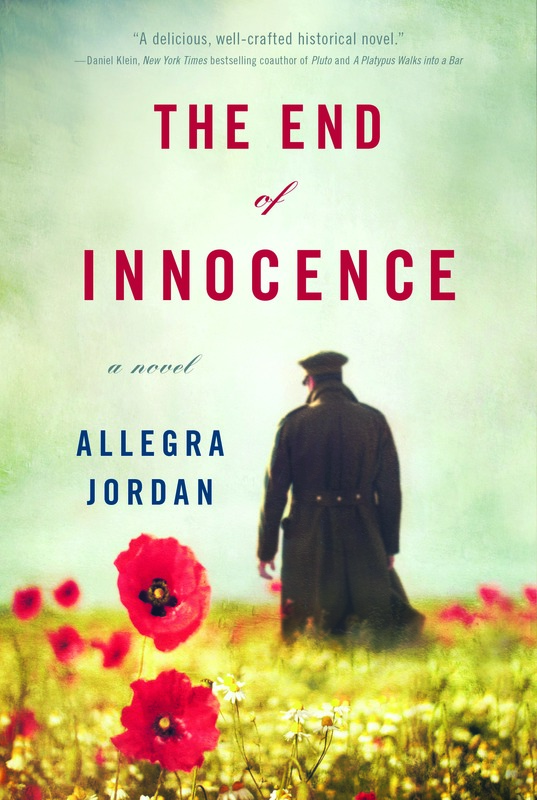 Luxe Beat Magazine has the exclusive sneak preview of Allegra Jordan’s book The End of Innocence. The wind bit into his neck. It burned his bruised ear, and the quick- falling snow piled around his boots. But the question repeated ceaselessly in his mind, like a record’s needle turning after the song is through, the machine’s energy not yet spent. It seemed like such a short time ago when one single death had brought his world to a halt. Mere months before, he’d been a student in America, at Harvard, when Max von Steiger, a fellow German classmate and childhood friend, had died. His death set into motion an unstoppable chain of events that had torn apart Harvard’s campus. Now, on the front lines of war, there were too many dead to mourn just one. He fumbled with the helmet strap trying to get it in place. “These wires—” “Brandl, you idiot!” Captain Grimber interrupted. Wils felt Grimber’s hand grip his arm and pull him around. He cringed at the sight of the gaunt man’s yellowed teeth and the smell of his stale breath. “Work without a helmet again and I’ll court-martial you. Heinsel, mark him down. Half rations for Brandl.” Wils scowled as the short, barrel-chested Lieutenant von Heinsel scratched his name in a small notebook behind Grimber. The captain took the transmitter and crouched on the duckboarding, his canvas-covered helmet bobbing as he examined the equipment with a skill that eluded Wils. The captain, like so many career officers in the Prussian army, thought that war brought out the best in people. His dull, cold eyes brightened when he spoke of a promised post in Paris. To get back there—for the German army had been close in October—the cables had to transmit. If they did not, orders from headquarters would not reach the front lines, and they would be blind to their enemies’ movements. Wils shivered as he looked at the captain’s hollow cheeks. Grimber looked up. “Sit down. Heinsel will pull a new line and you will bury it. The weight of the snow will snap it by noon if you don’t.” Grimber stood up and left for the barracks with Heinsel in tow. As Wils waited for the new line, a haggard, square-faced sentry passed by, stepping quickly over Wils’s snow-encrusted boots. Wils stared as the sentry craned his neck over the edge of the parapet, looking into the brightening gray horizon, and then left. Two soldiers rushed into the trench from the field carrying a large spool of barbed wire. They disappeared around the corner of the L-shaped trench toward the bun- ker. A group of soldiers with short spades and pickaxes slogged by next, blurry-eyed and muddied from the tops of their spiked helmets to the soles of their knee boots. One slipped on an icy patch of duckboarding, barely catching himself on the edge of the sandbagged wall. An hour passed and von Heinsel did not return. The snow had stopped, but the temperature dropped. Wils pulled his knees up and wrapped his arms around his legs, trying to conserve his weak body heat. The acrid fumes around him hurt his lungs. His toes and fingers were numb. His eyes fluttered as he fought exhaustion from the cold. He began to recall a place where a light wind would rustle the ivy’s brilliantly colored leaves, fanning them down one redbrick building, across Harvard Yard, and back up the tall columns of another. October would turn the Yard into walls of gold and red and orange. Smoke from fireplaces, dormant from a summer’s rest, curled into the clear blue sky. There, he sat beside her on the library’s steps, bathed in the sun. Lilac perfumed her dark curls. He lifted a ringlet and brushed it across his lips. Helen’s eyes were royal blue and clear—bluebells on her light skin, like those in the fields behind his house. He laughed as she told him about her latest poem. He took her hands, and her face moved closer to his. Her breath felt warm against his cheek as she spoke, and her eyes looked steadily into his. He took her in his arms, felt her sweater, her bosom, against him. He could taste her kiss—soft and warm. The touch of her lips soothed him. It relieved the pain in his stomach and the hurt in his chest. Suddenly, a flare shrieked into the air, close to his position. His body went rigid, and he looked furtively around his trench, expecting a shell. He waited and heard a distant explosion. He shook his head. The corridor of that part of the trench had not changed. Muddy sandbags were still piled in front of him. The gray mist hovered in the air. He put his hands over his face and closed his red, irritated eyes. He was hungry for her voice, her touch. He pulled out a ring on a chain around his throat and kissed it. He tried, but he couldn’t summon her back. The mud of Flanders had absorbed his dream. To continue reading the excerpt of The End of Innocence please view in the August 2014 edition of Luxe Beat Magazine. To learn more about the author go to www.allegrajordan.com.